While I’ve had lots of experience cooking vegetarian dishes, vegan cooking is a whole new frontier for me. When I was asked to attend a special cooking class with the Plant Butcher, Michael Abramson I was excited to learn from the best. Upon arrival I knew I was in for a treat. The Loblaws team had created a stunning display of fruits and vegetables for decor and centrepieces. I loved the way that vegetables were the star of the show and the centre of the table! Boil 10 cups (2500 ml) of water and add 1 tsp sea salt. Add mini potatoes and continue to boil until potatoes are easily pierced with a skewer – approx. 10-12 minutes, but will vary depending on potato size. Drain potatoes and rinse well under cold water to halt the cooking process. Take one potato at a time and place between the folds of a double folded, clean kitchen towel. Press down firmly to “smash” potato to about 1-1 ½ cm thickness. Place “smashed” potato on a parchment- or silpat-lined baking sheet and repeat with remaining potatoes. Preheat oven to broil. Brush “smashed” potatoes on both sides with olive oil and return to the baking sheet. Place in preheated oven and broil for approximately 4-6 minutes until the edges just begin to crisp up. Preheat oven to 350°F and walnuts on a parchment- or silpat-lined baking sheet. Place in oven for approximately 5-7 minutes – shaking pan every couple of minutes. Look for them to darken a shade and smell “toasty”. Be careful – toasting any nut can go from perfect to burnt in a matter of seconds. Place toasted walnuts and all other taco “meat” ingredients in a mini food processor and pulse until coarsely chopped. Keep a bit of texture. Wash and seed tomatoes. Chop into fine dice and place in medium-sized bowl. Finely chop onion. Add to bowl with tomatoes. Mince basil and jalapeno with seeds. Add to bowl. Add lime juice and sea salt and mix together gently; drain any excess liquid that has accumulated in the bowl prior to serving. Add cashews to 4 Cups (1000 ml) boiling water and boil for 5 minutes. Turn off heat and let cashews sit in water for an additional 5 minutes. Drain and rinse cashews and add to high speed blender with remaining ingredients. Blend at high speed until you reach a “sour cream” consistency. Add additional water 1 tablespoon at a time if required. Cover tightly with plastic wrap and refrigerate if not using immediately. On a serving plate, top smashed potatoes with 1-2 tsp walnut taco “meat,” 1 tsp of fresh salsa, 1 tsp of cashew sour cream and 1/2 tsp green onion. TIP: “Smashed” potatoes and taco “meat” can be made up to 4 hours in advance. Fresh cut tomato salsa may be kept refrigerated for 2 days. Cashew sour cream may be kept for one week if covered and refrigerated. In celebration of all the spectacular food found #NearYou at Loblaws stores we are giving away a $100 PC gift card for you to create your own feast! Contest is open to residents of Canada 18+ and ends on August 24 at 11:59pm. Good luck! I would buy some squash and make some stuffed squash recipe, they should be coming out soon for the Fall season!! Love vegan food and will try this recipe. Actually the VEGAN SMASHED FIESTA POTATOES looks good. I like to try new things.. I would make the VEGAN SMASHED FIESTA POTATOES. Apple Cranberry Crepes recipe sounds great for sure, I would enjoy making that. I would make the SMASHED FIESTA POTATOES. Apple Cranberry Crepes recipe sounds wonderful. yum! I’d try to make the giftcard last by adding fresh herbs and spices to my normal shopping. The kind of stuff I’d normally avoid in favour of the cheaper, dried stuff, but could totally justify with a $100 giftcard. I would make the tomatoe Salsa! I’d make the Cauliflower Steaks! I would buy some tomatoes and make the tomato salsa! Corn and black bean salad with lime-cilantro vinaigrette using local sweet corn, red and green peppers, garlic and onions! I’d make the Taco “meat”. I like the way the table is set up for the Vegan Smashed Fiesta Potatoes, it looks GREAT. I also like the different variety of vegetarian dishes . Since there are so many local produce items to choose from right now I am thinking I would love to make a nice big pot a vegetable soup up. Tomato Salsa would be nice too. Fresh salsa is my favourite! I’d make that tomato salsa since my daughter is currently obsessed with salsa and chips. But for me some roasted zucchini fresh from the garden. I would make a veggie lasagna! Thanks! I’d make VEGAN SMASHED FIESTA POTATOES! The Apple Cranberry Crepes recipe would be great. I would make fresh tomato salsa with all the fresh tomatoes available right now. I would also like to try these Vegan Smashed Fiesta Potatoes. They look like something all my family would enjoy eating. I would make Scalloped Tomatoes. Vegan Smashed Fiesta Potatoes for sure! I would try Roasted Potatoes with Poblano Peppers! It looks delicious! Chicken. Tomato, Kale and Feta Pasta would be top of my list. VEGAN SMASHED FIESTA POTATOES, of course! the VEGAN SMASHED FIESTA POTATOES would be something i would def try! Wow, the VEGAN SMASHED FIESTA POTATOES would go over very well with my vegan sisters when we get together for family gatherings over the summer in Muskoka! I grow my own produce. Lately i’ve discovered zucchini is awesome! The Tomato Salsa would be the one I’d try both for nachos, and in tacos. I would do Maja Blanca (coconut pudding) with sweet corn using only the best corn in town – Taber corn. If I win, I will try to make Apple Cranberry Crepes. i love homemade Salsa so would try Tomato Salsa! I would make a fresh cucumber, tomato and feta salad! I would make VEGAN Smashed potatoes if I won the card, thanks for the chance. I would make a tasty vegan dinner for my family! I would make Lasagna with fresh tomatoes and a salad on the side. I’d use the gift card to buy the ingredients to make steak and kidney pie. The Vegan Smashed Fiesta Mini Potatoes would really go well at my house we were raised British, Irish German when it comes to potatoes and have them with most meals. 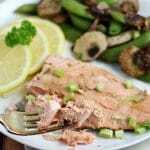 Though I will always be an active omnivore Veggies always took the biggest side of the plate though vegetarian style with butter or cheese. Potatoes as hash browns are already popular I would love to try this vegan recipe . Having potato salad tonight with olive oil, garden chives ,parsley, lightly grated carrot, crunchy organic celery with sweet red and yellow peppers and seasonings. Made it last night to allow the flavors to infuse. I would have made your recipe had I seen it first. I would make fruit salad. I would like to make the Cauliflower Steaks! I’d make something with locally grown tomatoes, probably a Tomato and Spicy Sausage Ragù . I would make a delicious shephards pie with lots of veggies. I would like to make MANY of the recipes featured at Loblaws, but the Chicken Salsa con Queso Pretzel Pizza looks great! Potato, Leek and Carrot Soup. My father already loves Potato Leek soup so this would be a great variation to try. I would make the potato recipe! I would make a delish chicken cobb salad – with locally grown produce, eggs and poultry! I would like to make a fresh salsa with tomatoes, onions, pepper and cilantro from local produce. It would have to be the salsa…We love it here. I would try making the Vegan Smashed Fiesta Potatoes. They look great! I would make a fresh mixed vegetable stir fry. 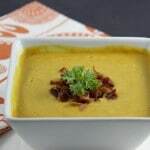 The potato Leek and Carrot soup looks yummy. I might add squash as well when it comes out fresh and localin the fall. I would make vegetable lasagna! I would make Apple Cranberry Crepes :) Yum! I would make the Apple Cranberry Crepes! i love homemade Salsa so for me I would make the fresh tomato salsa and serve it up with taco chips and melted cheddar cheese. I would like to try the Vegan Smashed Fiesta Potatoes! One my favorite things to make, especially if I can get all fresh ingredients, is a Garden Salad!! Another meal that my whole family enjoys is Vegetable Stir fry!! I’d make the Tomato Salsa. I have a potato soup recipe that I’ve been meaning to try out so I would use that! I would make the tomato salsa. I would purchase local tomatoes to make salsa which I would use to make salsa chicken. I would love to try the Vegan Smashed Fiesta Potatoes! I would like to make my own tomato and corn salsa. I’d roast corn on the barbecue and use it to make a salsa. Roasted fresh local baby beets with balsamic on some fresh kale leaves. The smashed potatoes look fabulous & I would also like to make a roasted garlic cauliflower casserole with local produce! I would love to make the grilled romaine chicken salad. I’d like to try making the tomato salsa – I’ve always wanted to try doing it myself and have never actually done it! I’d have some peaches & cream Ontario corn on the cob, and a mozzarella and tomato salad (ON field tomatoes). The VEGAN SMASHED FIESTA POTATOES sound really yummy and would make them first. I would make fried green tomatoes. Toss up between the potatoes or the taco “meat”. I would make the Vegan Smashed Fiesta Potatoes and a side dish I make with zucchini and corn. I’m always looking for new vegan recipes to try. I would make the Vegan Smashed Fiesta Potatoes! I would make the grilled romaine with chicken. I love local produce and when everything is in season. Salsas are such a great fresh example. So many variations and levels of spice. I would try the VEGAN SMASHED FIESTA POTATOES. I’d love to try the cauliflower steaks! Sounds yummy! I would love to make the VEGAN SMASHED FIESTA POTATOES. I would make Vegan Smashed Fiesta Potatoes, Tomato Salsa, and a nice garden salad! 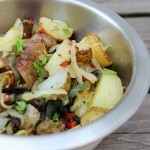 I do like the Vegan Smashed Fiesta Potatoes and I would make lots of recipes with fresh green and yellow beans. I love new potatoes so my first choice recipe is VEGAN SMASHED FIESTA POTATOES! the grilled romaine chicken salad is similar to something i have seen them do on the food network and it looks delicious! I would make a huge batch of borscht using local beets! I would love to try the VEGAN SMASHED FIESTA POTATOES and I think the kids would like it too! I have always wanted to try making stuffed, roasted peppers. Since the summer started I have wanted kebabs on the bbq so I would make skewers of veggie kebabs! The Vegan Smashed Fiesta Potatoes. I’ll make a fresh pasta salad! the salsa sounds delicious and tangy- and the cashew sour cream sounds intriguing. It is the perfect time of year to make Salsa with fresh products. I think that the Apple Cranberry Crepes recipe would be the one I’d like to try the most… love Crepes! I would use local produce to make tomato salsa. The stuffed squash recipe sounds delicious, especially that fall is approaching. I would make a lobster poutine using PEI potatoes and local fished lobster! I would stock up on meat!! I would want to make fresh bruschetta and serve with garlic bread. I ould make Potato Assembly. I would like to try making Vegan Smashed Fiesta potatos as it looks good! Thanks! I would love to use local apples to make Apple Crumble. I would make the Romaine Chicken Salad. Looks delicious! Taco Salad – Fresh tomatoes/cucumbers/cheese – and remember to eliminate the CHILIES. To complete the dish a dollop of Ranch Dressing – followed by a movie. apple cranberry crepes sound delish! I would make potato bacon soup , using fresh potatoes and fresh parsley ! its a hit with the fam ! I would make Peaches and Cream Oatmeal Muffins. I would make tomato salsa. I would make some peach jam. I would make a shrimp stir fry that features locally farmed green peppers, broccoli, and celery. I’d make peach cobbler during this short and sweet time we can get it so fresh! just from what you said before, Cashew Sour Cream sounds actually super cool and delicious. Caprese Salad! <3 Fresh basil & tomatoes from my garden plus fresh mozzarella & olive oil from Zehrs! I would make a ratatouille. I would use it to make a Waldorf Quinoa Salad. Its healthy and looks delicious. I enjoy Mexican so taco “meat” vegies look interesting to try. Definitely going for the vegan smashed fiesta potatoes! If I won I’d try the TOMATO SALSA, even if I don’t win I’m gonna try it, it sounds very good! 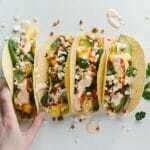 I always love trying new but easy recipes that are a healthier option over store bought mass produced items such as jarred salsas or things loaded with preservatives. Apple Cranberry crepes sound divine! Vegan Smashed Potatoes would be my choice it does look so good and not unlike dishes my wife creates for us. I would never go fully vegan but I would eat more veg we enjoy it too. I’d make cheezy corny potatoes! my own recipe and it’s yum! I would definitely make the Vegan Smashed Potatoes! I think they would be a huge hit! I would definitely make the Smashed Fiesta Potatoes. Looks delish! The Vegan Smashed Fiesta Potatoes recipe you made sounds delicious!! I love potatoes every which way! If I won I’d probably try that recipe, but I’d also try their Chicken Pot Pie recipe! I’ll try anything Vegan, starting with this Smashed Fiesta Potatoes recipe! I would try the CAULIFLOWER AND ARTICHOKE GRATIN recipe. I’d make a salad out of local cucumbers, kale, tomatoes, carrots, blueberries and red cabbage. I’d make cherry pie with fresh BC cherries! I would use local veggies to make a potato and cauliflower curry, love it! I would make the vegan smashed fiesta potatoes! Thank you very much for the chance to win, and try out some new receipies! I would like to try VEGAN SMASHED FIESTA POTATOES. I am in for the Vegan Smashed Fiesta Potatoes! VEGAN SMASHED FIESTA POTATOES for sure. I would make the tomato salsa! I would make my version of Beef Fiesta which has ground beef, corn, tomatoes, and green peppers, all of which I can get locally and fresh. Fresh Tomato Salsa – so good!